Our hotel has valet parking only with in and out access. Self-parking is available in the lot across the street however without in and out privileges. 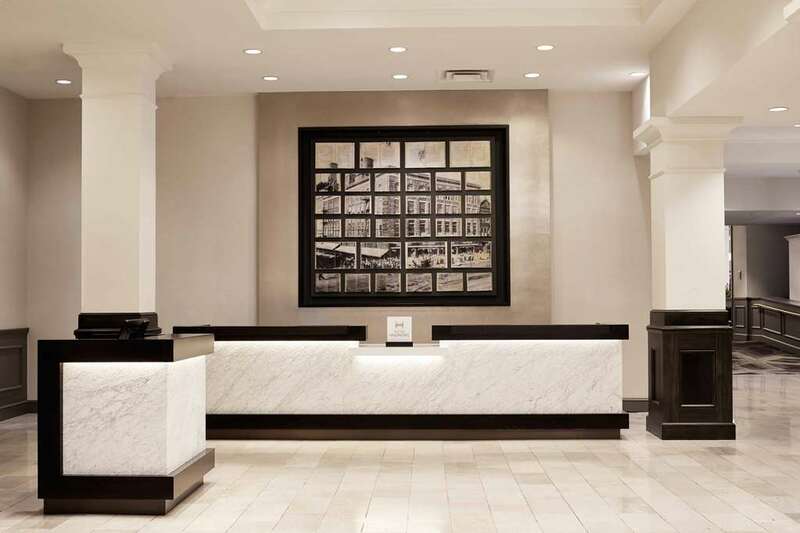 Traditional southern charm meets modern amenities at Hilton Richmond Downtown. Our downtown Richmond Virginia hotel is housed in the former Miller - Rhoads department store an iconic building with over 100 years of history. The restored building spans an entire city block and boasts original features such as the lobby*s marble floor laid in 1883 and high ceilings. Enjoy easy access to all that Richmond has to offer including theaters historical sites museums and restaurants as well as the Greater Richmond Convention Center. Take the complimentary shuttle service to destinations within two miles of the hotel including Main Street Station where Amtrak runs through Richmond numerous times each day. Unwind in a comfortable guest room with work space complimentary WiFi a mini-refrigerator and a coffeemaker. For a memorable experience select a suite located on the corner of the hotel offering incredible views of the city. With three onsite restaurants and a wealth of nearby restaurants guests have plenty of choice for dining. Grab and go or stay a while at 1885 Cafe - Market savor Italian specialties at La Grotta or enjoy a local beer and tasty burger at Thirst - Fifth Lounge. /Maintain your exercise regimen at the fitness center take a dip in the indoor pool or simply relax in the whirlpool. With 15 000 sq. ft. of flexible event space whether you*re hosting a grand celebration important meeting or spectacular wedding our downtown Richmond Virginia hotel is the ideal choice blending historical charm with modern spaces and professional service. Thirst - Fifth Bar: Located on the lobby level Thirst - Fifth offers a selection of small plates local brews and creative cocktails.